We have a tag “Top Ten Views” – a worthy accolade we think – useful and certainly helps if you’re choosing a place to eat for a special occasion. So, speaking of special occasions, we should really have a category for places when we’ve been lucky/unlucky* [delete as appropriate] to bear witness to a proposal of marriage – “Places suitable for a proposal” perhaps. Or maybe not. It’s become a little too frequent. Are we going to places which are advertised as “romantic” by mistake? Are we too old, and we’ve accidentally stumbled into places that are reserved for the dewy-eyed twenty somethings? Well, it’s happened at Gordon Ramsay’s Royal Hospital Road [sudden hush, man down on one knee with the Maitre d’ hovering with a fixed smile]; and in the middle of Ibrox at the Commonwealth Games Rugby Sevens where the couple were going to be “interviewed” on the pitch. After the shocked bride-to-be had accepted they took a tour, arm in arm, round the ground. They got more cheers and “Glasgow Waves*” than even the Ugandan Rugby team, and that’s saying something. Proposal Number 3 was at our previous visit to the Olive Tree three or four years ago. Much like the Gordon Ramsay experience, a sudden move from chair to floor by the exceedingly nervous young man, followed by an equally shaky (shocked rigid more like) young lady who finally managed to say ‘yes’. Phew, that nearly went wrong! Pause for applause round the room, where previously everyone had been trying to maintain polite conversation and look the other way. Of course none of that takes anything away from the Olive Tree. Housed in the basement of the Queensberry Hotel it really is a special place. Very good – great – food and wines. 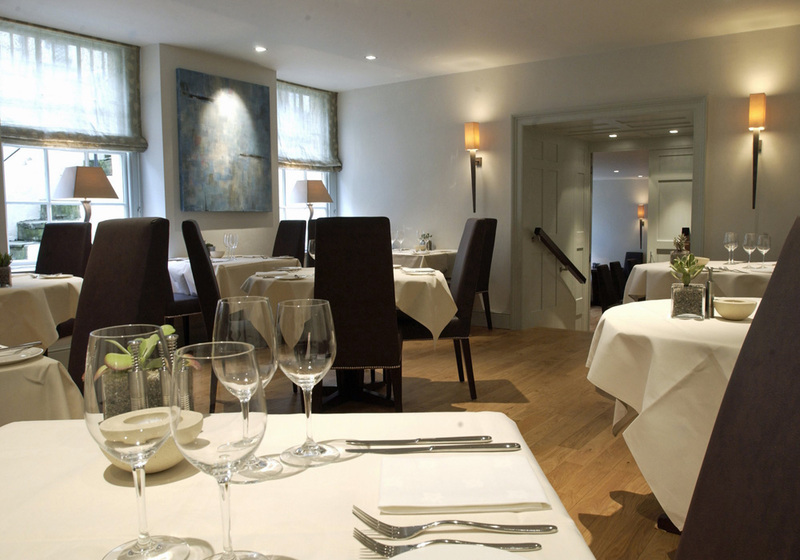 A seasonal à la carte menu (we’re in spring at the moment) and a good value seasonal tasting menu. You could choose anything from the menu – it all appeals. Although there are plenty of places to eat in Bath, this is the only 3 Rosette restaurant (it says here). Dinner last week was simply excellent – all three courses without fault – and the crab lasagne simply a triumph. Perhaps for the truly fanatical the lamb was a little over cooked [still pink and just the way we like it, but most definitely dead]. Small but adventurous selection of wine by the glass. Smart but not stuffy. Dress code? Why not make the effort, they do. *Glasgow Wave – a half-hour continuous version of the Mexican wave, all around the ground. Images from Concept Interiors, who designed the interiors of the restaurant and hotel.